The daily life of University of Iowa graduate student. By the way.... This is my 100th Blog post! Go me! So, here's a quick note before my genetics exam. Speaking of which...Why the hell do I have to retake Genetics?? This is one component of the UIowa Biology Ph.D. Program that I just don't get. I made an A in genetics just three years ago...why are they making everyone take it again? Pffffffft! I'm beginning to get very acquainted with failure. My project is to measure nuclei volume in several polyploid snail lineages. Sounds easy, right? Well... it's not. At first my project was to measure cell size in these snails. Well, that has some problems: 1.) Exactly what kind of cells; and 2.) What are we defining as size? Snails, or any other organism for that matter, contain a vast array of cell types. From cilliated epithelium that cover the outside of the snail, to phagocytic cells that wander about looking for foreign bodies to digest. Each cell type has a variety of shapes and sizes that can be almost impossible to measure. Plus, enter the problem with microscopy. Focus on one point of the tissue, and you have taken a visual cross section of the sample. This cross section rarely contains cells within the same plane--producing wide variability in apparent cell size. The only way to accurately calculate cell volume is to take a 3-D picture of the cell and use an algorithm to determine the volume. Not easy. So, that brings me to my list of failures. At first, I thought I would do simple histology to make a cross section of a specific tissue. This didn't pan out, as the plane problem became apparent. So I had to find out a way to separate out cells. I tried using a micro pestle and Eppindorph tube to no avail.... tried freezing the tissue with liquid nitrogen and powdering it with some limited success... and then tried dragging fresh snail tissue across a cryo-cold slide to get intact epithelial layers. All the while dabbling with different methods of fixation and staining which I could go in to great length about...But I'll save you. 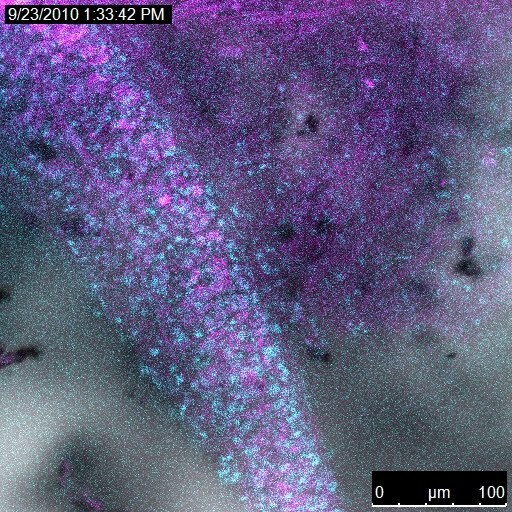 So now the confocal is producing pretty images (although not exactly free of noise). Unfortunately it looks like this might not be the best route, either. I was hoping to get images of well-defined nuclei, create an image stack, and then determine the volume using spiffy software. The plan is to return to the DIC and focus until nuclei have their largest apparent diameters, measure, and then assume they're a sphere. What else can I do at this point? Anyhow.. here's some pretty images that I got today. 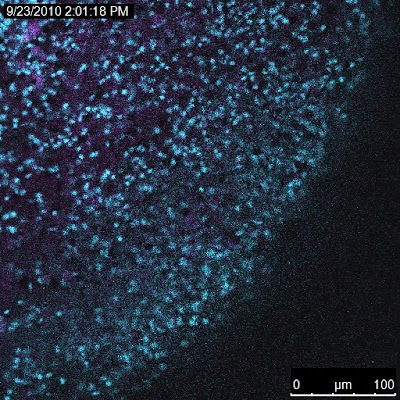 Anything blue is nuclear (Stained with DAPI), and anything pink is cytoskeletal (Stained with Phloxine). More failure (and hopefully eventual success) soon! Like Leland said... They call it research for a reason. If everything got done the first time they'd just call it 'search'. Are you sure those are eukaryotic cells? Insofar as I can tell. Some of the background noise is likely due to bacterial contamination on the surface of the snails. The nuclei are right at 5-6um in diameter (i.e. Small). 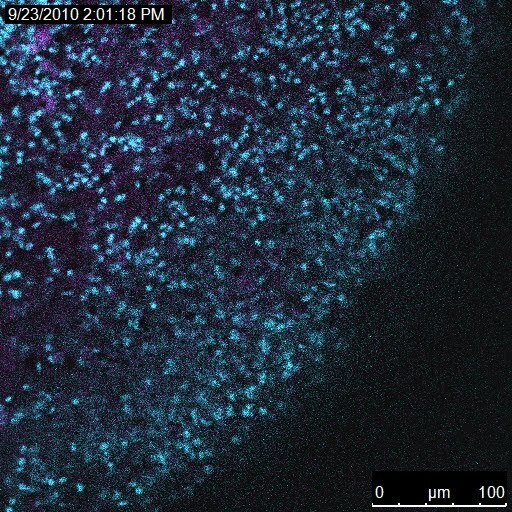 The Confocal doesn't give a good appreciation of what you're looking at. 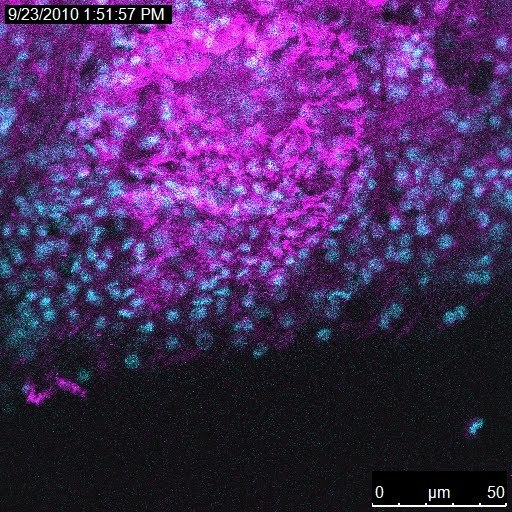 The second image is confocal overlain with DIC and you can make out a little bit of the strucure. The protrusion in that image is of a snail antenna. "If we knew what we were doing it wouldn't be called research"
You will be pleased to know that I am in the process of writing a blog post. It should be up on Monday.